According to reliable sources, the Orange County District Attorney's Office has completed its investigation into the Costa Mesa 60th Anniversary Celebration that was held two years ago and ended under a cloud of suspicion of misuse of money, violation of city policies and procedures and other issues. 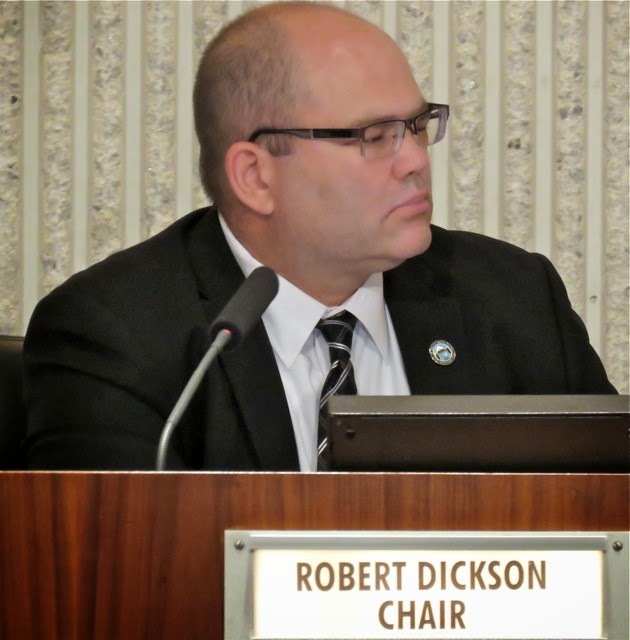 The OCDA has wrapped up its investigation and concluded there is insufficient evidence to prove any criminal activity beyond a reasonable doubt and will take no further action. No determination of whether City policies or procedures were violated was made. However, the issue of a Forensic Audit of the 60th Anniversary Celebration is on the City Council agenda for Tuesday's meeting. The question will be whether or not to solicit bids for such an audit, which may cost up to $25,000, depending on the complexity. It will be very interesting to see if the council majority decides to stonewall any further investigation of this event by denying the use of a Forensic Audit. Or, will they attempt to get this debacle behind us once and for all by spending twenty-five grand of CEO Tom Hatch's contingency fund for the audit. It will be an interesting roll of the dice at the end of the agenda Tuesday night. 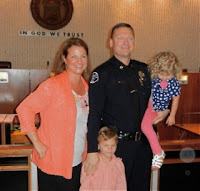 With the recent announcement of Captain Rob Sharpnack, a 22-year veteran of the Costa Mesa Police Department, as the new Chief of Police, the residents of our city can be encouraged that there will, once again, be stable, professional and competent leadership at the helm of that once-proud department. The trick now is to give him the tools to do the job. We all should be grateful to Interim Chief Ron Lowenberg, the consummate professional, for helping to stay the course while this decision was being considered. Things have fallen on hard times for the CMPD over the past several years. Beginning with the economic downturn almost a decade ago, when the CMPD joined other city departments in scaling back to meet the financial realities of the moment, and on through to the current time, when ignorant, capricious, vindictive and ill-advised elected leadership has failed to acknowledge the needs of the department so necessary to provide a safe city. That short-sightedness is now coming home to roost. Following the retirement of legendary Chief Dave Snowden a dozen years ago - who had carried on and expanded the tradition of excellence established by former Chief Roger Neth - there has been a trail of successors in that job, some of whom were outstanding and others not-so-much. Steve Staveley served the city twice as Interim Chief and brought more than four decades of exemplary law enforcement leadership to the assignments. He left the last time, four years ago, after having had enough of the interference and micro-managing of the elected leaders. He described the council majority at that time in his lengthy departure letter to the men and women of the CMPD, HERE, as, "incompetent, unskilled and unethical". Members of that council majority remain today. 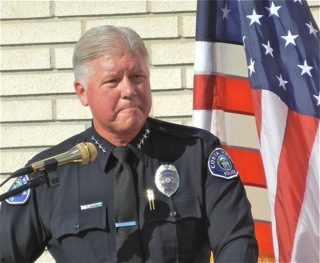 Former Chief Tom Gazsi, after three decades with the Newport Beach Police Department, took over the helm of the CMPD nearly four years ago in the midst of turmoil caused by the toxic atmosphere created by the above-mentioned elected leadership that chased more than four dozen officers out of the department to earlier-than-anticipated retirement or to other jurisdictions. His department was disemboweled by the policies of the elected leadership. They shut down the A.B.L.E. helicopter program - a joint venture with the City of Newport Beach and the model for ALL municipal airborne programs country-wide. Their actions forced the elimination of specialty units, like the Narcotics Squad, which had taken thousands of pounds of drugs off our streets and was, in fact, a profit center for the City by accounting for millions in asset forfeiture dollars. Staffing policies forced the reduction of the Gang Unit and the Detective Bureau, premium assignments that most officers covet. We once had a dozen motorcycle officers patrolling our streets, keeping us safe, but we now have only two, and have at least a half-dozen motorcycles sitting in storage with no staff to operate them. For several years Costa Mesa police officers led Orange County in the number of DUI arrests - an important element of public safety in a town with so many bars and liquor stores. 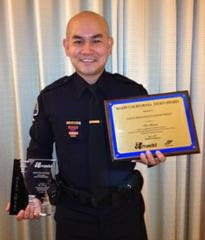 Officer Kha Bao, alone, accounted for more than 400 such arrests one year. Today, because of the diminished staffing levels, those numbers have dropped off a cliff and our streets are not as safe. 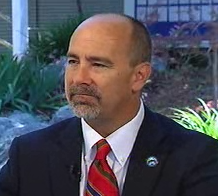 Gazsi, currently the Deputy Chief of the Los Angeles Port Police and recently named Acting Chief of that department, accepted that assignment late last year after apparently receiving little support for initiatives designed to shore-up and re-build the CMPD. A resident's Public Records Requests recently unearthed a couple documents that shed a great deal of light on the battles the CMPD has been fighting. For example, more than a year ago Gazsi provided CEO Tom Hatch an in-depth analysis of the attrition experienced by the CMPD in recent years and a detailed road map toward resolving many of the issues, which was apparently never even acknowledged, much less acted upon. Parole offenders are placed in the county of their residence (before incarceration) and it IS NOT a violation of parole to be temporarily or permanently homeless. While offenders are not generally placed in sober-living homes, if a condition of their parole includes treatment for chemical dependency, some offenders will seek such treatment with a residential option - like a sober-living home. There has been an observed rise in offender caseload since the implementation of AB109 in 2011. Offenders acknowledge that conducting criminal activity, especially drug sale/use, is more desirable in Costa Mesa now than in previous years due to the perceived lower risk of arrest and the greater prevalence of drugs and related offenders in the community. Offenders verbalize their understanding that CMPD is understaffed and sightings of police officers in the community is less frequent. Increasing numbers of offenders are seen around a popular Costa Mesa shopping center area, described as "prison yard-like" conditions. Offenders openly engage in drug transactions. Offenders are being more visible during daylight hours, as well as areas previously perceived as "hot" due to police presence. Offenders are less cautious and more brazen in their criminal activity. 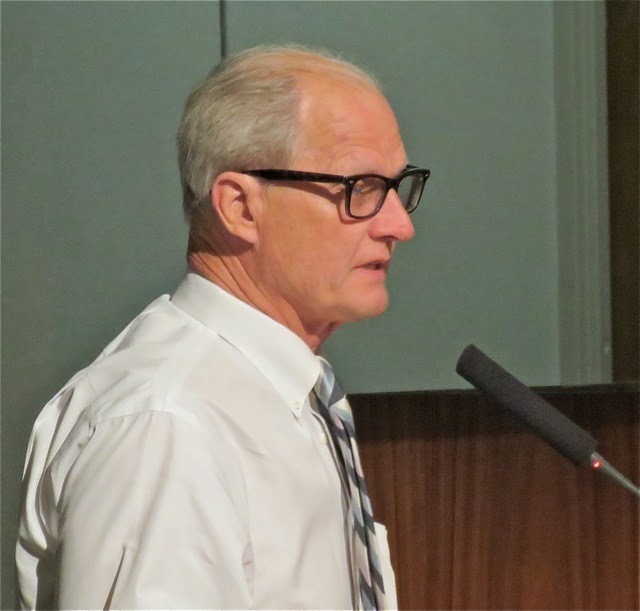 There has been a dramatic rise in heroin use among probation and parole offenders and some of them report that Costa Mesa has had a major influx in the availability of heroin and an increase in the heroin drug trade. This includes juvenile offenders. 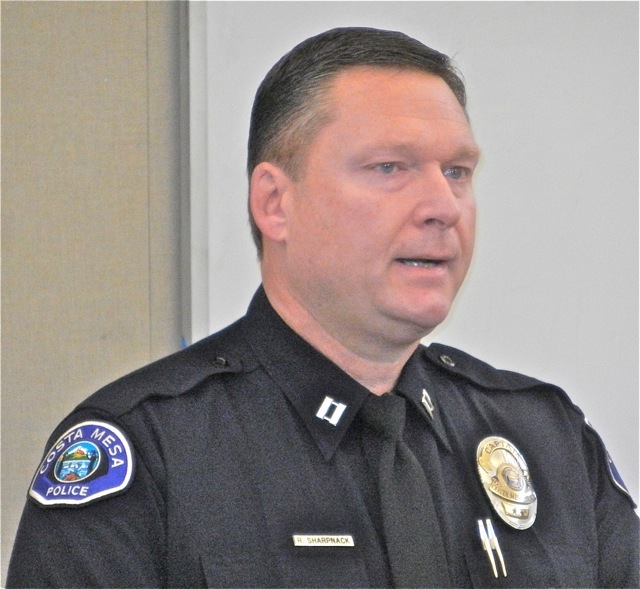 Based on observations and conversations, there has been a marked shift in the criminal demographic and attitude in Costa Mesa in the last couple years. This is largely due to a perceived visible increase in the number of criminal offenders in the community and the perceived reduction of CMPD resources to effectively deter criminal activity. This information actually does not surprise me, since we've heard many similar anecdotal reports from residents and friends in law enforcement for a couple years. Crime is up and folks are afraid. During the Snowden era the CMPD was staffed with more than 160 sworn officers, had a full array of specialty assignments and was considered a destination department - a place where experienced officers sought to work. Today, the flow has reversed. 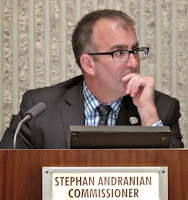 The policies of the current elected leadership majority created an artificially-contrived staffing level more than 15% below the level recommended by the consultants hired by the City to do an assessment of the organization, and as recommended by Staveley, Gazsi and Snowden. The elected leaders pegged their staffing level at 125 - an absolutely unworkable number. Today the authorized strength is 136 officers, but five of those are "grant positions", with a shelf life about to expire within the next year or so. There are 26 open sworn positions in the CMPD following the naming of Sharpnack as Chief, with more vacancies on the way as more officers depart for other venues and some senior officers retire. Due to staff vacancies and injuries, fewer than 100 officers are available for duty. Today we have large sections of our city being patrolled exclusively by very junior officers much of the time. Despite the best efforts of the Human Resources Department and the CMPD staff assigned to recruitment to provide transfusions of new officers, we simply cannot keep up with the hemorrhaging. There was a push to attempt to sweeten the pot to attract Reserve Officers, but that's a dying breed. We have NOT been successful recruiting people into those slots, despite a dramatic increase in the salary level demanded by the council majority, who arbitrarily just plucked a number out of the air at one council meeting. We have NOT been successful recruiting officers from other departments. Law enforcement is a very close brotherhood - and they all can read. 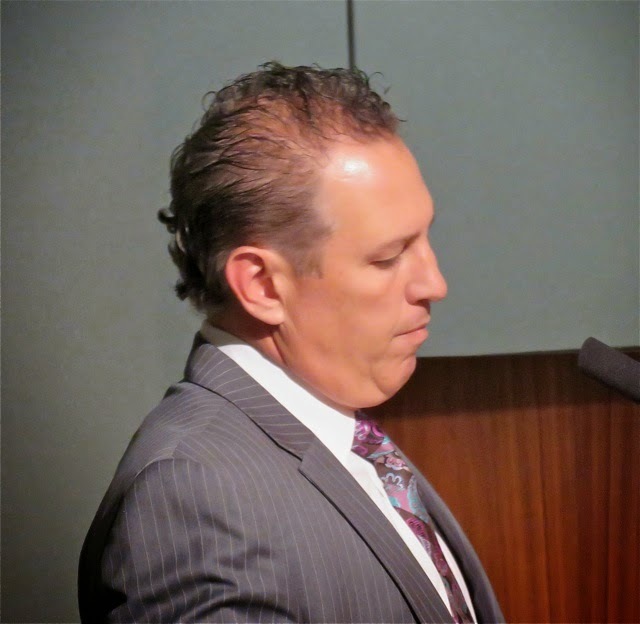 The men and women of the Costa Mesa Police Association have been sued by Mayor Steve Mensinger and Mayor Pro Tem Jim Righeimer and have been working without a contract for a year. Negotiations - without those two council members participating because of the conflict - have been sporadic, at best. That uncertainty has also affected our ability to recruit. As mentioned above, the demand for policing has NOT decreased, but has actually increased. 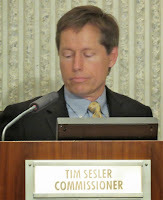 The proliferation of sober-living homes, and what appears ot be a related increase in drug and property crimes; the increase in numbers of probationers and parolees as a result of state laws; the probability of Medical Marijuana dispensaries being permitted in the city and, very likely, the passage of initiatives for recreational marijuana use next year state-wide next year, all increase the demand for solid, pro-active policing. Today the CMPD cannot provide the coverage necessary for our current situation, much less the anticipated increase in demand. Overtime hours to cover shifts are taking a huge toll on the staff. We are just a few weeks away from approval of the 2015/2016 Municipal Budget. In its preliminary form there is NO PROVISION for increase police staffing. In fact, the current budget document shows a NET DECREASE in staff, which is no surprise to me, considering the hostile attitude held by the majority on the City Council toward law enforcement in this city. However, there is still time for the public to speak out and DEMAND more resources be made available to Chief Sharpnack and his command staff to fight the rising threats in this city. WHERE TO WE GET THE MONEY? There are several ways to provide more funding for police - and public safety generally - in the current budget by simply re-prioritizing. For example, there is currently $4 million earmarked for the proposed Neighborhood Community Center/Library project. As witnessed a year ago, when Mensinger yanked 60% of the funding for that project at the last minute to replace brand new landscaping near his neighborhood, the library project is apparently NOT a pressing community need in the minds of the council majority, so should be shelved, at least this year, so more public safety resources can be funded. NO MORE "POTHOLES BEFORE PUBLIC SAFETY"
The current council majority has consistently put potholes before public safety. They constantly crow about what a great job they're doing paving our streets. This year the budget contains more than $22 million for Capital Improvement Projects. 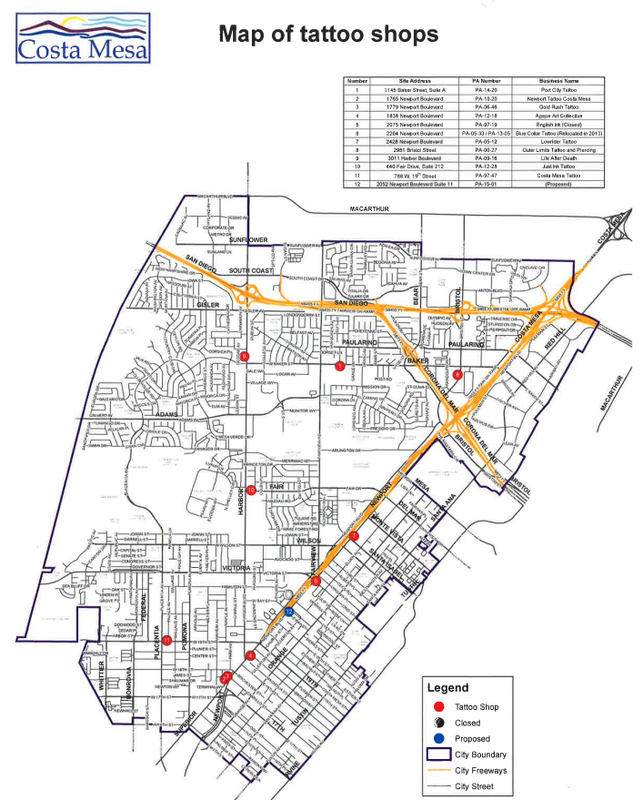 Certainly, all of us like nice, new streets, but some of that funding could be diverted for the next couple years to help fund public safety staffing and other resources. I'm not suggesting abandoning those projects - just re-prioritizing our requirements. MORE COPS AND A CONTRACT, NOW! The City should add AT LEAST a half dozen positions to the authorized strength of the CMPD this year - remember, we're going to lose those grant cops soon - and MUST do what it takes to get a contract with the CMPA immediately. 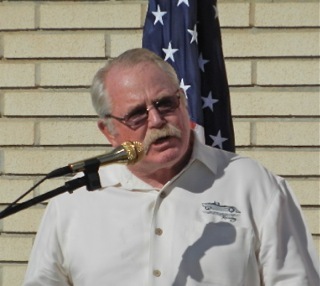 Lame duck councilman Gary Monahan MUST STOP being an obstructionist to that process and do the job we're paying him the big bucks to do. THE CHIEF NEEDS THE TOOLS! 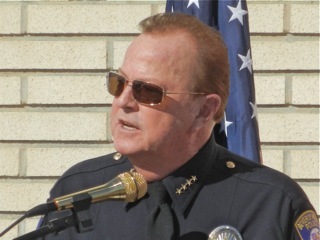 If we fail to provide Chief Sharpnack the tools - the manpower and technology - to do the job, Costa Mesa will become a destination, not for those upwardly-mobile young families we hear so much about, but for criminals of many stripes. Public safety MUST come first. By now many of you have already heard that Captain Robert Sharpnack has been named the new Chief of Police for the City of Costa Mesa. The city announcement can be read HERE. As stated in the announcement, Sharpnack has been with the CMPD for 22 years and has held a wide variety of progressively more responsible positions within the department. 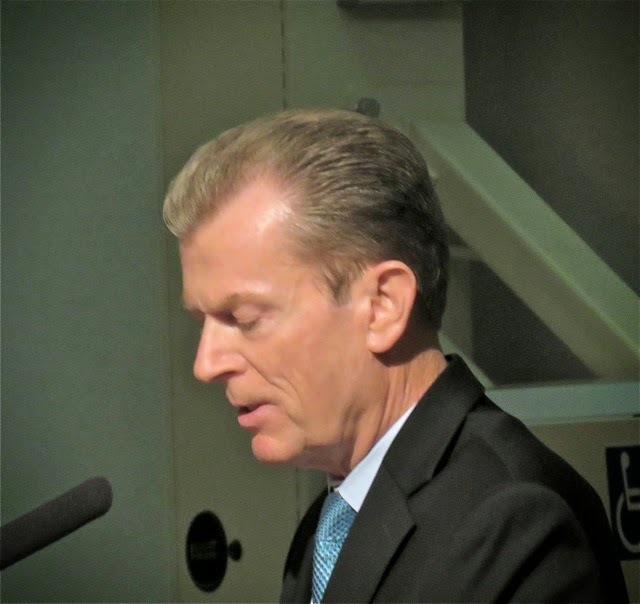 During his tenure he has seen the department go from a "destination" department to one for which it has become increasingly difficult to recruit because of the toxic atmosphere created by the current City Council majority. He has seen previous chiefs come and go - some of them exceptionally well-qualified and some not so much. He's seen many of his peers retire early or leave to other jurisdictions. He has seen the authorized sworn strength of the department slashed to the bone at a time when more boots on the street are needed, not fewer. Nobody can say that Rob Sharpnack didn't know what he was getting into when he accepted this job. WILL HE BE GIVEN A CHANCE? Personally, I'm very happy for him and his family. And, I'm happy for the men and women of the CMPD and the residents of this city. Rob Sharpnack knows what this department has been in the past, knows the men and women of the department and knows what they are capable of. The big question I have is, will the council majority and CEO Tom Hatch give him the tools to do the job necessary to keep this community safe? Will he be permitted to bring the department back to the once-lofty stature it held only a few years ago? Only time will tell. Plums, Tattoos, Motor Scooters And "Monsters"
The Costa Mesa Planning Commission met on a rare Tuesday evening - Memorial Day was Monday - and took four hours to take care of business. And, as an aside, this is the first Planning Commission meeting in recent memory at which a member of the Costa Mesa Police Department was deployed as Sergeant-at-Arms. Fortunately, no riot occurred. 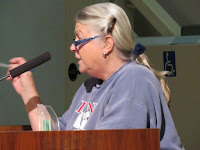 Public Comments saw several residents step up to voice their concerns about important issues. 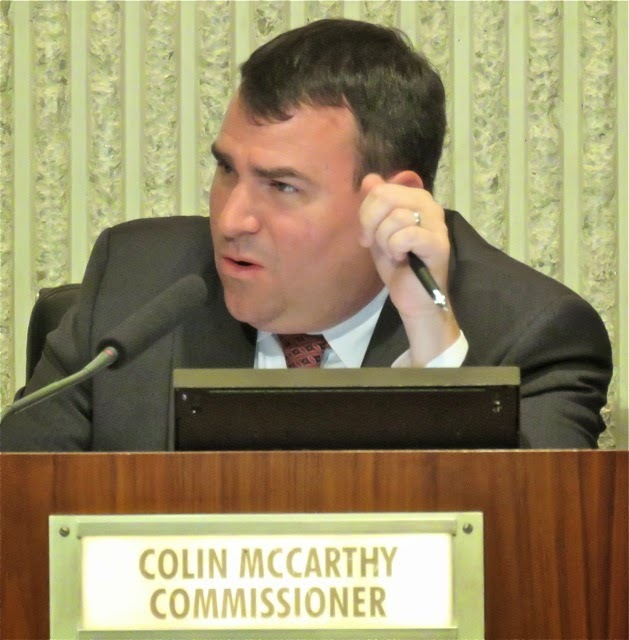 Former City Council candidate Chris McEvoy pointed accusatory fingers at commissioners Colin McCarthy, Tim Sesler, Mayor Steve Mensinger and the commission in general. He felt some of them had been untruthful and may have been influenced by campaign contributors. 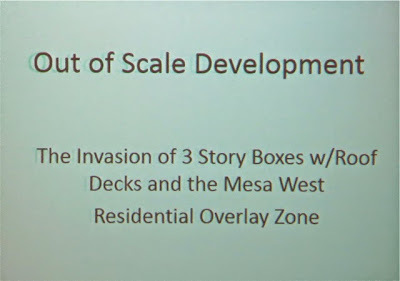 HUFFMAN ON "OUT OF SCALE DEVELOPMENT"
Rick Huffman gave a PowerPoint presentation of what he felt was Out Of Scale Development. 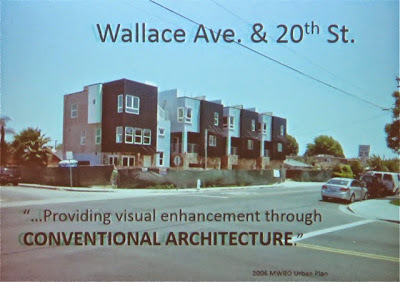 He showed examples of several projects that he felt were not compatible to the surrounding neighborhoods. The final slide is the development at the corner of Superior and 17th Street, which he felt was more appropriate because it sat in an industrial area. 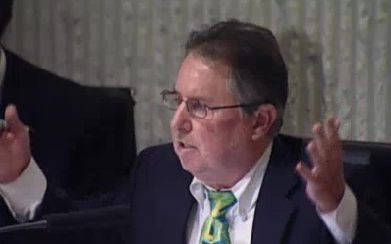 He quoted from the Westside Overlay Plans, citing some of their goals which seemed to not be met by recent projects. Barrie Fisher again criticized parking problems throughout the city. Ann Parker again raised the specter of the proliferation of Sober Living Homes throughout the city, and particularly on the Eastside. 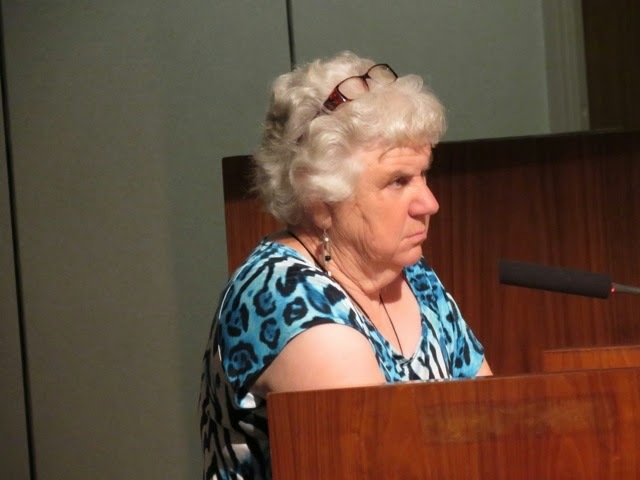 She complained that commissioner Stephan Andranian reversed his decision to appeal a recent decision on one case, forcing her to spend the money to have the item appealed. Mary Spadoni echoed Parker and wondered about Code Enforcement activities. She asked for an update on the R-2 Ordinance. During Commissioner comments Stephan Andranian read a memo he sent to staff on the issue raised by Parker and felt that, without a new ordinance in place, nothing could be done, which is why he pulled his request for an appeal. It's unclear whether Parker will continue with her appeal. Tim Sesler speculated that 30/40 houses wouldn't make a dent in our housing shortage and responded to Fisher's comment about parking by observing that that problem exists wherever there is high density housing. 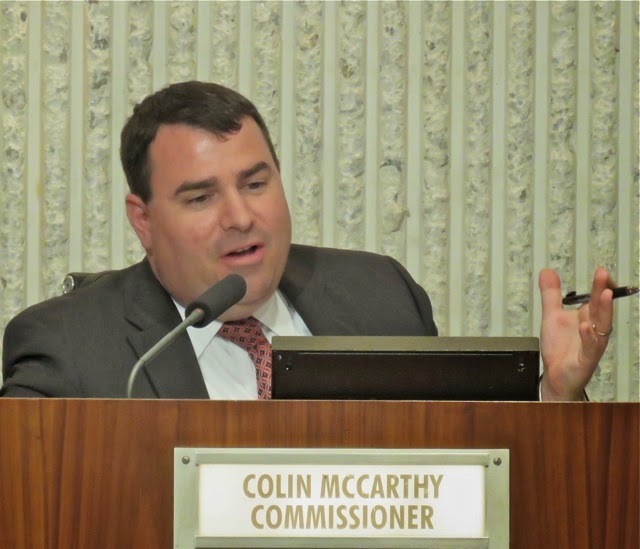 Colin McCarthy observed that we could solve the parking problem instantly by imposing a "No Parking After 2 a.m." rule city-wide. Then he praised the Mayor's Ball. He made an interesting observation - that it was nice to see so many staffers at the event, stating that they "didn't have to go", but it was nice that they did. Yeah, no pressure there or anything... He also observed that the Fish Fry was coming this weekend. 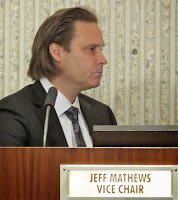 Vice Chair Jeff Mathews had nothing to say. Chairman Rob Dickson made up for it, though. 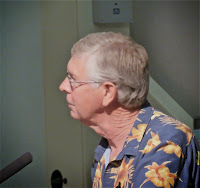 He wondered to staff about Code Enforcement staffing, the status of the R-2 Sober Living Ordinance, Westside Plans updates, the Parking issues and illegal units, indicating that he thought the city should adopt the policy in place in Newport Beach and other cities in which every home sale requires a pre-sale inspection by the City to ensure code compliance, including bootleg granny flats. Public Hearing #1, the review of the development agreement of Pacific Arts Plaza was up next. 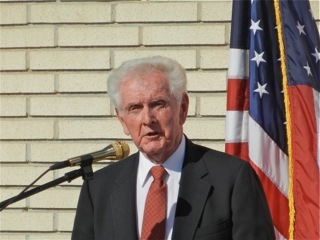 Dickson recused himself because the law firm for which he works does work for The Irvine Company, so Mathews took over. This one didn't take long. After a very brief staff report by Assistant Director of Development Services, Claire Flynn, the representative of The Irvine Company stepped up and said they had no current development plans for the property. In a curious comment, McCarthy observed that he and his wife had been out to dinner and were driving home through that area and he actually complained that there was no traffic! He's an odd duck. The commission moved the item by minute order, 4-0. 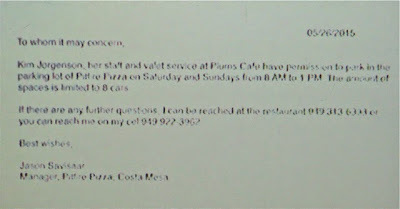 Next came the request from Plums Cafe for some changes in operating hours and approval of their parking plans, to include the use of Valet Parking to accommodate the requirement for additional parking due to the expansion of their operations. In what should have been a pretty straight forward item, the discussion stretched and stretched and it took nearly two hours before the vote was taken to approve the plan, 5-0, but not without some dicey moments. Plums representative, Bill Dunlap, at one point told the commission that condition #10, which would require them to close the enhanced operation if the parking plan didn't work out, was "unacceptable". Maybe, but it is a standard requirement and it remained a part of the approved plan. The discussion waltzed around the recently-created 28 parking spaces adjacent to Pinkley Park behind the shopping center in which Plums is located. They were off limits for the purposes of considering whether the expanded project is properly parked. Several people spoke in favor of the plan, but the commission had a list of 13 business owners in the center who were against the project. None of them took the time to come to the meeting to speak and explain why, though. There was also discussion of the on-again, off-again potential agreement with the Pitfire Pizza store next door about using part of that parking lot for valet space. Dunlap produced a barely legible memo, which McCarthy demanded be included in the record, that stated Pitfire's intent to cooperate. A few minutes later, as the discussion moved forward, McCarthy said he had contacted the author of that letter - which had just been presented to them a few minutes earlier during the meeting - who indicated that he didn't want it to be part of the conditions of approval because he wasn't sure what the future of Pitfire might be and didn't want a potential new restaurant to be burdened with the agreement. It's strange that McCarthy is communicating privately with a party to an issue before the commission DURING the meeting, and delivers his version of what that person said on an issue that is important to the decision the commission will be making. Methinks the commissioners should be required to park their cell phones with the clerk during the meetings to avoid the inappropriate distractions. Here's the barely-legible note Dunlap presented. 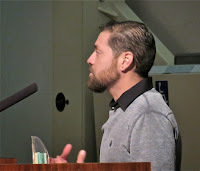 Another interesting element of this discussion was McCarthy's apparent disbelief of the parking study presented by the consultant hired by Plums, Linscott Law and Greenspan. Instead, he relied on his own personal experience in the shopping center to tell him that there are parking problems. 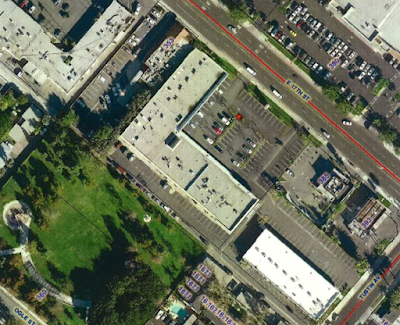 As confirmed by Flynn, LLG has worked on such projects in Costa Mesa for nearly a half century and had NEVER had a traffic or parking projection prove to be inaccurate. And yet, there is McCarthy, choosing to disregard their work in favor of his anecdotal personal experience. MCNIFF - "GET IT RIGHT THIS TIME!" Five people rose to speak on this project - most of them in favor of it. 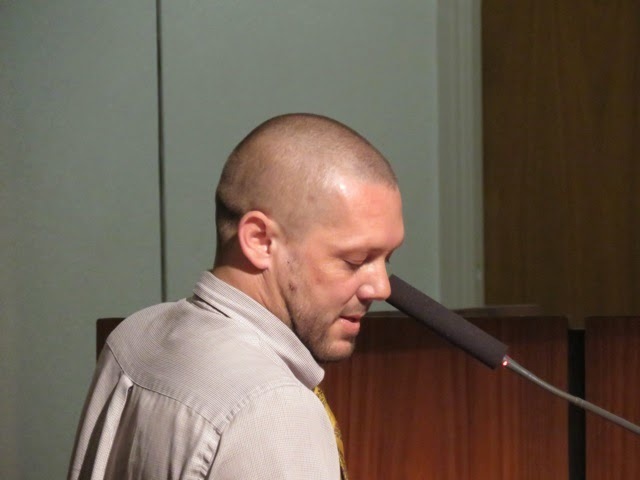 The lone dissenter was Grant McNiff, who lives nearby on Tustin Avenue and has suffered from the Beach Pit BBQ joint for years. He cited rats in the garbage, parking agreements that went south when ownership changed in an adjacent business where parking was part of the equation. He counseled the council to get it right this time, indicating that Ogle Street was so impacted by traffic and parking now that it had not been swept for 28 years. The commission approved the project with the valet parking intact and the staff will perform a personal review within 30 days of the completion of the project. McCarthy wanted to "condition" the action on the applicant working with Pitfire, but the staff sat shaking their collective heads on that one. It was NOT part of the approval. Another report is due from the applicant two months later. It was an interesting part of the evening. Next up was the scooter store at 1536 Newport Blvd, which has been operating without a proper conditional use permit for a couple years. A complaint apparently brought this up. Apparently, according to the applicant who spoke, a lawsuit had been involved and the applicant won. His partner in the business died a few months ago. Several times he said all he wanted was some peace and quiet so he could run his business. It only took about 20 minutes for the commission to pass this request unanimously. Then came the biggie of the evening. 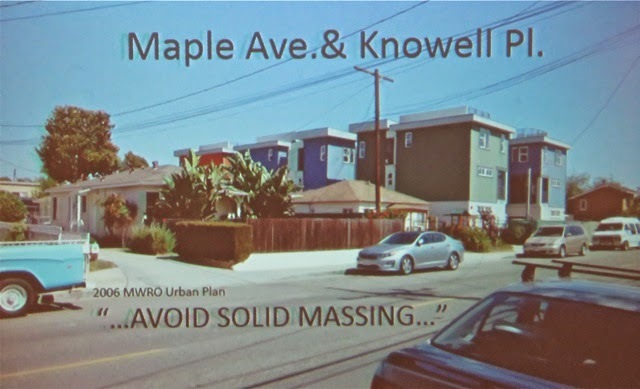 At 9:00 the commission began hearing about the 4-unit development at 2068 Maple Avenue and, once again, the spokesperson for the developer was former Director of Development Services and Deputy City Manager, Don Lamm, who appears to be making quite a nice living representing developers in Costa Mesa these days. In a nutshell, this project crams four 3-story vertical units with rooftop patios onto a single quarter acre lot next to a similar project being built amongst single family homes on the other side of the street. Lamm admitted that he advised his client to try to produce a product like the one next door. This project does some sleight-of-hand with the parking - it provides the correct raw numbers, but goes about it in a strange way. 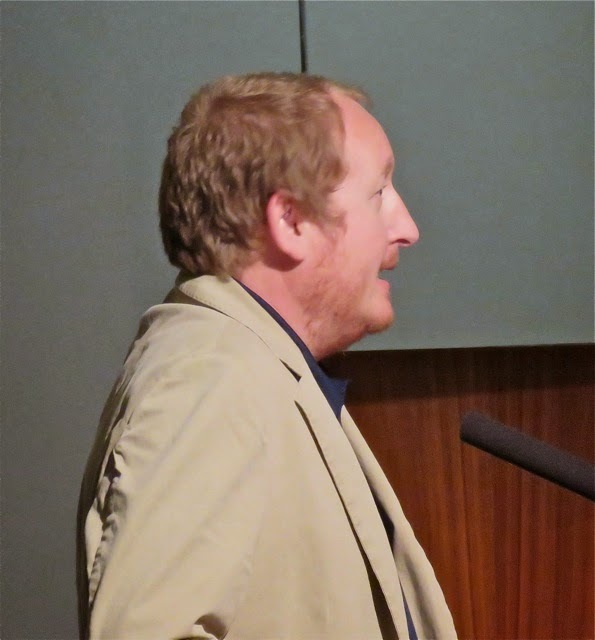 Five people spoke against this project, including the above-mentioned Huffman, who used it as a perfect example of the wrong project in the wrong place. He cited the place next door as a "monster", then said the mindset is to build the monster, then use it as a justification for another monster next door. 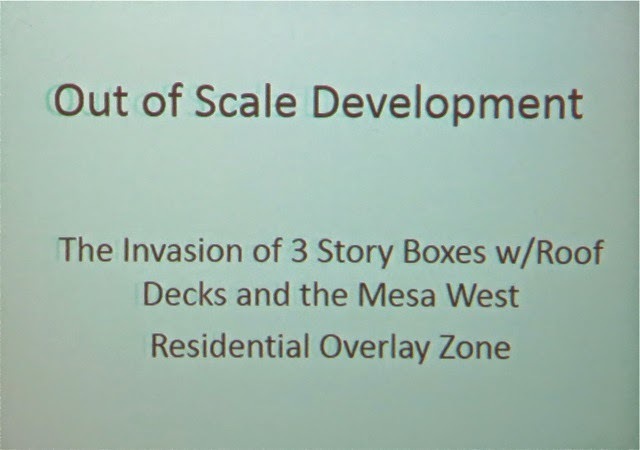 In response to some of the criticisms, McCarthy pointed out that this project is governed by three sets of zoning rules: 1) It's zoned R2-MD (medium density), 2) The Westside Overlay and 3), The Small Lot Ordinance, all of which justify this kind of development. He cited it as "textbook Urban Plan" development, and said "we can't change the zoning"... which was yet another strange thing for him to say. The commission passed this item on a 5-0 vote. 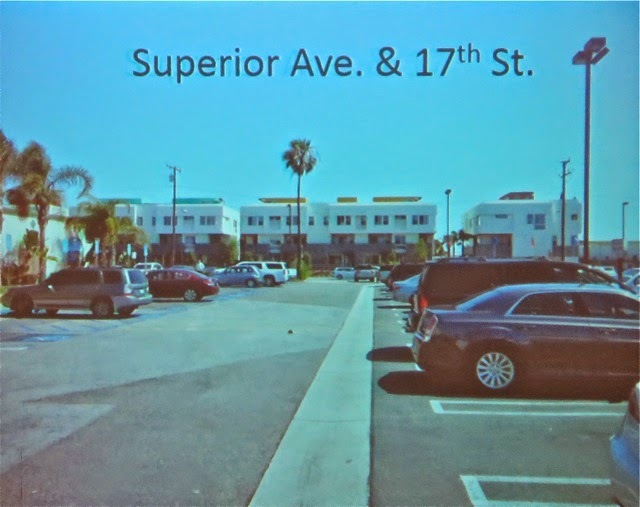 The final item of the night was the request for a CUP for a tattoo shop at the corner of Bay Street and Newport Boulevard. The commission took less than 10 minutes to hear and approve this request from Raymond Burciaga - a man who was raised in Costa Mesa and plans to raise his family here. In a final bit of strangeness from McCarthy, he voted no because, "I don't like tattoo parlors." Good Grief! This week in Costa Mesa has an abbreviated schedule of official meetings. The City Council has a Special Closed session Wednesday, HERE, (NOTE: The special closed session has been cancelled.. no quorum!) in which negotiations with the two Fire organizations will be discussed, but you can't attend. The Parks and Recreation Commission meeting originally scheduled for Thursday has been cancelled, but we're not sure why. The Finance Committee meets tomorrow, but few actually care about it or attend the meetings. If you really want to attend, the meeting is in Conference Room 1A and begins at 3:30 p.m. The agenda is HERE. However, we DO have a Planning Commission meeting scheduled on Tuesday, May 26th, at 6:00 p.m. in City Council Chambers. You can read that agenda HERE. There are only five (5) items on the agenda. 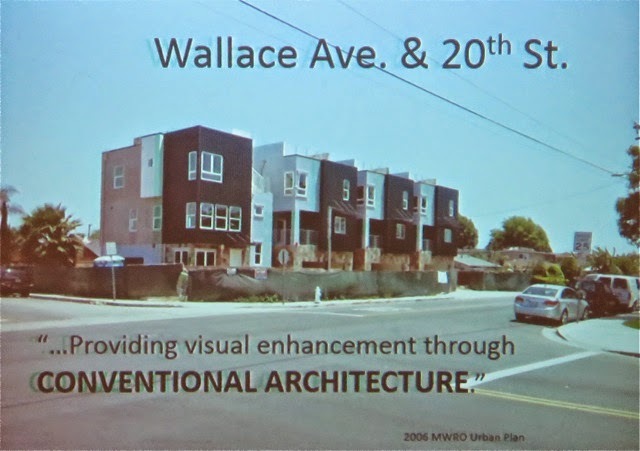 First is Public Hearing #1, HERE, is the two-year review of Pacific Arts Plaza, an area bounded by Bristol Street, Anton boulevard, Avenue of the Arts and 405 Freeway. The staff recommends approval. 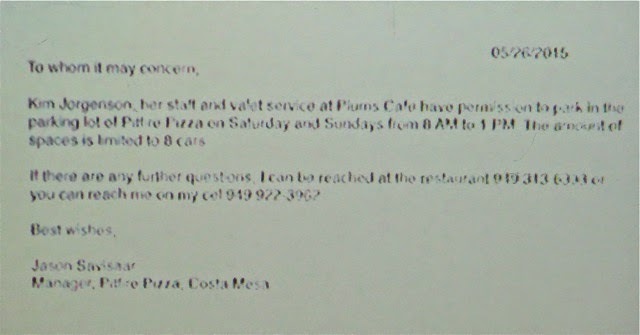 Next up is Public Hearing #2, HERE, a request from Plums Cafe, 369 E. 17th Street, Suite #8, for a conditional use permit for 1) valet parking service during peak hours on Saturday and Sunday, from 8 a.m.-2 p.m. and 6 p.m.- 11 p.m. and, 2) an amendment to a zoning application to expand their use of space and deviate from the Shared Parking Requirements. Staff recommends approval. 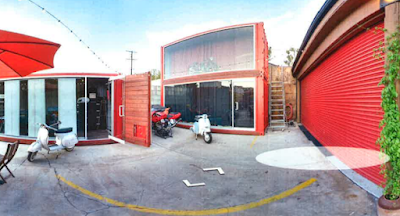 Public Hearing #3, HERE, is a request for a conditional use permit for sale/outdoor display, and repair services of motorcycles within 200 feet of a residential zone and use of storage containers and a planned signing program at 1536 Newport Boulevard. Apparently the operator has been operating in violation of codes for more than two years and has been cited several times. The staff recommends approval. Public Hearing #4, HERE, is a planning application and tentative parcel map for four (4) detached residential units at 2068 Maple Avenue. This is another of the three (3) story plus roof deck developments popping up all over the Westside like so many mushrooms. 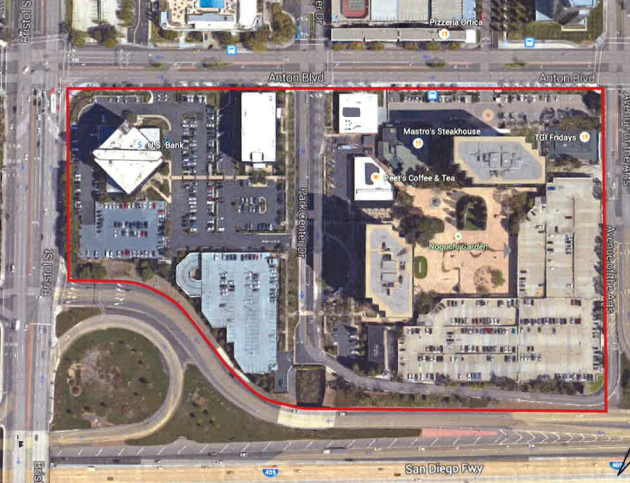 This one includes deviations in lot size and front landscape setbacks and appears to meet the parking requirements. That's it for this meeting. 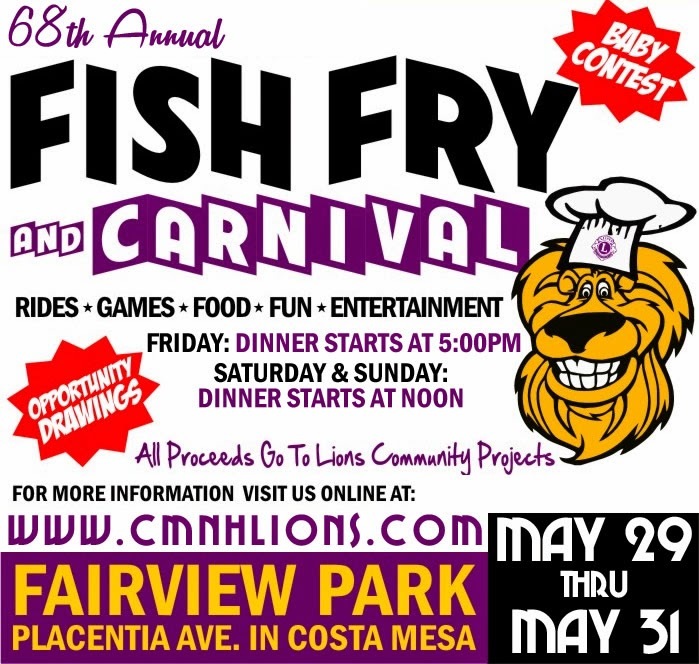 However, Friday, May 29th, begins the 68th annual Costa Mesa-Newport Harbor Lions Club Fish Fry and Carnival at Fairview Park. You can learn all about it by clicking on their website, HERE. Once there you can find out how to receive a coupon for $1.00 off on a Fish Dinner. So, plan to spend at least part of your weekend at Fairview Park, for rides, food, entertainment and lots of fun.